Arguably the finest location in Bell Canyon, this inviting Mediterranean architectural estate sits on a private 1.24 acre promontory surrounded by city light views in the front and the tranquil vistas of the Santa Monica Conservancy in the rear. 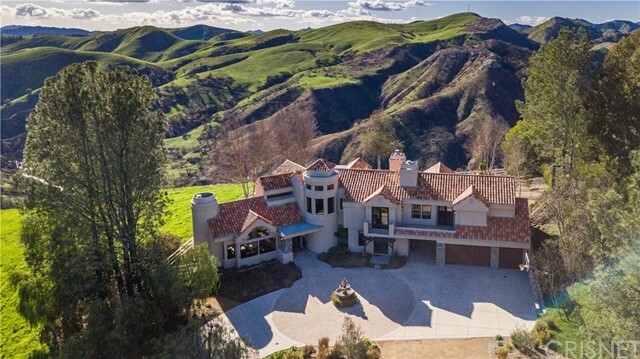 A long private drive leads to this custom home which has recently undergone an extensive remodel both inside and out, utilizing the highest quality materials and craftsmanship, elevating this residence to the next level. The elegant living room offers beamed ceilings and a custom limestone fireplace while the formal dining rooms walls of glass doors frame the romantic sunsets. The new center island kitchen offers custom cabinetry, full-figured granite and Miele appliances. The inviting family room features a custom stone fireplace, built-in entertainment center and an espresso and wine bar. The downstairs bedroom has been transformed into a beautiful study. Upstairs, the secondary bedroom suites are generous in size with walk-in closets and designer bathrooms. The master suite offers inspiring vistas that capture both the sunrise and sunset with two spacious viewing decks. The spa-like master bath is finished with Botticino marble, an automated soaking tub and a beautifully handcrafted his and hers walk-in closet. Outside you will find a freeform pool with a tranquil waterfall. The huge pergola provides plenty of room to enjoy the verdant grounds. This is a rare opportunity to own a truly custom estate with a one of a kind setting. Based on information from CARETS as of 4/26/2019 8:53 AM CST. The information being provided by CARETS is for the visitor's personal, noncommercial use and may not be used for any purpose other than to identify prospective properties visitor may be interested in purchasing. The data contained herein is copyrighted by CARETS, CLAW, CRISNet MLS, i-Tech MLS, PSRMLS and/or VCRDS and is protected by all applicable copyright laws. Any dissemination of this information is in violation of copyright laws and is strictly prohibited. Any property information referenced on this web site comes from the Internet Data Exchange (IDX) program of CARETS. This web site may reference real estate listing(s) held by a brokerage firm other than the broker and/or agent who owns this web site. The accuracy of all information, regardless of source, is deemed reliable but not guaranteed and should be personally verified through personal inspection by and/or with the appropriate professionals. IDX by Commissions Inc.